While it's not cheap, relative to other hotels in the city it's the best deal. Plus, I can't beat the location in the middle of famous Robson St. These spacious suites have a unique double bank of windows and small balconies. 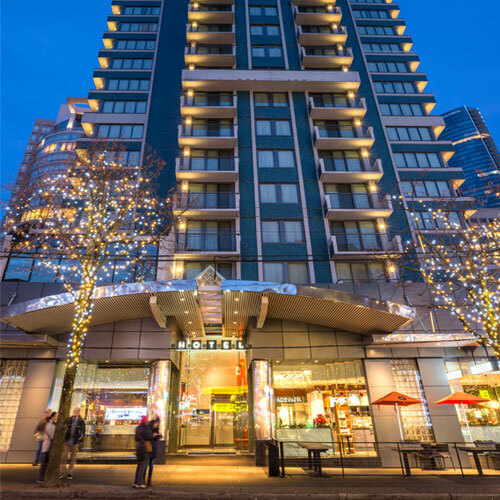 Higher floors offer incredible views of the city, English Bay or nearby mountains depending on the room location. Guests here will be treated to stylish modern bathrooms with dual shower heads. Smoke free premises. 214 units. 31 stories, interior corridors. Accessibility (Call). Between Jervis and Bute sts. 1225 Robson St V6E 1C3. Station: Burrard. hot tub, steamroom, exercise room.